We impart different Honeymoon Tour Packages for meeting the distinctive preferences of the customers. The range of tour packages includes Rajasthan Honeymoon Package and Jaipur Honeymoon Tours, where the couple can cherish the beautiful and colorful culture of people while enjoying the moments of togetherness. Our Special Honeymoon Package and Romantic Honeymoon Tours have so far been admired by several of our clients for their excellence, marvel and beauty. Your tour itinerary of Rajasthan India with Registhan Tours will start from the pink city of Jaipur. Our representative will receive you and take you to the hotel. Evening you will be taken to Samode village for Special Honey Moon Dinner at one of the best palace converted into hotel “Samode Palace”. After entering Samode Village you will stop at one of the place and from there you will be taken for Camel Safari which will end at Samode Palace. After having dinner leave for Jaipur. Jaipur, the capital city of Rajasthan, is one of the most sought after tourist destinations of the state. As you tour the pink city of Jaipur, visit its tourist attractions covering Hawa Mahal, City Palace, Jantar Mantar, etc. Browse through the colorful bazaar and shop for handicrafts, jewelry, textiles and souvenirs. Take an excursion trip to Amer Fort. Evening you will be taken to One of the best restaurant of Jaipur “Chokhi Dhani”. Travel to the blue city of Jodhpur in Rajasthan. Popularly known as the royal city of Rajasthan, Jodhpur is located on the edge of the Thar Desert and is dotted with a number of forts and palaces. Enjoy a sightseeing tour of Jodhpur and visit Mehrangarh Fort, Mandore and Jaswant Thada. Travel to Udaipur en-route Ranakpur. Known for its Jain temples, Ranakpur is an important Jain pilgrim center. Take a visit to Ranakpur Jain temples. Built in the 15th century, the architecture of Ranakpur Jain temples resembles to that of Khajuraho temples. Covering an area of 48000 sq ft, a tour of the Jain temple complex will give you a glimpse into the rich history and architecture of the past. Proceed to Udaipur. After arrival, check-in at the hotel. Rajasthan tour itinerary India covers the most romantic city of Rajasthan dotted with fairy-tale palaces and massive forts, Udaipur. Popularly named as the city of Lakes, Udaipur beckons people to savor its timeless beauty. 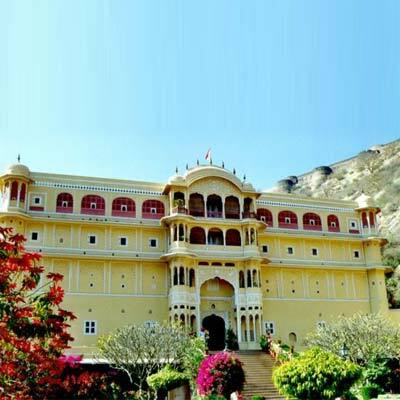 Tourist attractions in Udaipur include Jagdish Temple, City Palace, Pratap Memorial, Saheliyon-ki-Bari, Bharatiya Lok Kala Mandir, Pichola Lake and Fateh Sagar. After sightseeing tour of Udaipur, return to the hotel. After breakfast, transfer to the airport/railway station to board the flight/train for Home.